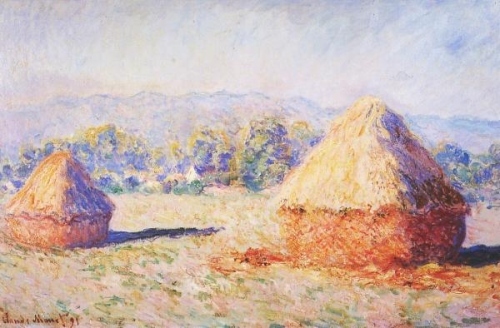 Monet Haystacks, investigate impressionistic painting and the color of shadows. a great way to investigate impressionistic painting and discover the color of shadows. Why even bother with Monet Haystacks? 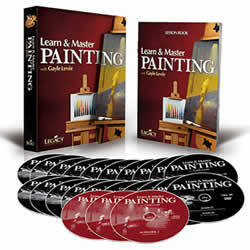 Well, if you want to understand impressionistic painting better, you study the Masters. 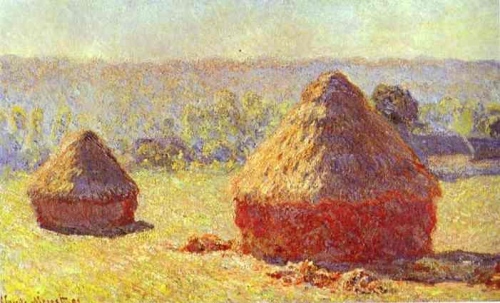 And Monet was a Master at Haystacks! Monet created this series of paintings of a common rural symbol in the French countyside over different times of the day, and even different seasons. See how he approached each one as he explored light and color in the ever changing world around him. These paintings will also show you a great way to understand what color of shadows he used to make these works sing! 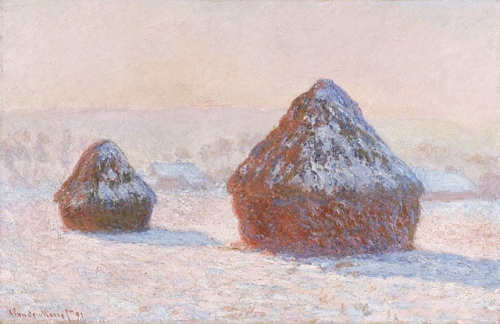 Monet was obsessed in discovering what color light was at different times of the day, and in Monet Haystacks he was so interested in discovering this light in early morning, and in late evening. When doing a series of paintings, he would have his assistants hawl out a canvas, he would paint it awhile, until the suns position changed too much for what he wanted in the work. His assistant would hawl out yet another canvas, and Monet would continue on the same subject, but with different lighting conditions. How he kept track of which painting corresponded to what time of day it was, I don't know, but he repeated this process for most of his series paintings. His large canvas's I'm sure were a real burden to the assistants he had hawling them back and forth. Especially for works like this, where the subject matter was several miles from his home! Why did he pick haystacks? Well, firstly in his search for light and color and it's effect on objects at different parts of the day, but also for the symbolism behind the haystack. The haystack is a symbol of rural traditions. Remember, industrailization and urban sprawl was becoming prevalent with the railroads and big cities beginning to boom. It's the same today in it shows the fertility of the land and success of our local farmers. Doesn't it bring your heart joy when driving down the road today, and you come across a field full of haybales strown hether and yonder throughout the field. Makes you want to pull right over and begin painting! Now, lets get to the paintings some more. Remember in my first article, (impressionist painters) I talked a bit about an American Physicist that had a revolutionary explaination of color theory. His name was Ogden Rood. I'm happy that they couldn't un-publish it! As it helped in developing one of histories greatest art movements. Read more on the history of impressionism by clicking here. Anyway, Monet drank Ogdens' theories in, and used these color theories in developing his own pallette of colors and how he mixed his paints both on the palette and on the canvas with broken color. I show some great closeups of his canvas brush strokes here in which he employes the broken color technique in "Monet Impressionism". 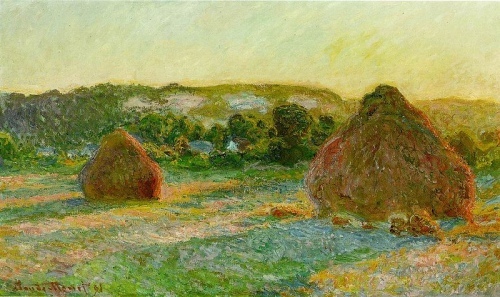 Monet Haystacks, wheatstacks summer morning. Link to the National Gallery, Wash. DC "Impressionists"
Lets look closely at these paintings. Notice anything different besides being "Impressionistic"? Check out the shadows closely. The artist (another impressionist) Renoir stated, "No shadow is black, It always has a color. Nature knows only colors.... white and black are not colors." When you look at these paintings, the shadows are mostly violets, blues, and dark reds, maybe crossing into the browns. Using Ogden's new theories in complementary colors, seeing a predominantly yellow, orange haystack, Monet utilized the violets (complementary to yellow) to produce his shadows. Impressionist painters made these violet tones using red as a base, and then glazing over top with a cobalt blue or ultramarine blue. They also had access to new tubed colors of manganese violet pigments. And sometimes they mixed them on their palette and applied as a glaze. 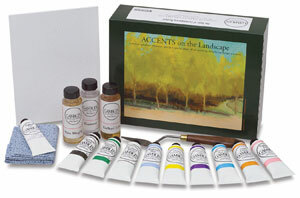 This is evident here on this page about "how to paint like Monet". I have a great closeup of a brush stroke of violet in a Monet water lily painting. Monet was able to create some pretty rich browns and grays without using earth tones. He combined the new synthetic oil paint colors, cobalt blue, cerulean blue, ultramarine, emerald green, viridian, and more to create deep shadows. He eliminated black from his palatte the more he got into this new color theory of Ogden's. If you've visited the site before, you'll understand I show a great deal on painting in a indirect, flemish method. I do use a more impressionistic style in my landscapes. I also like to pass on to you great instruction when I find it, and below is just that case. 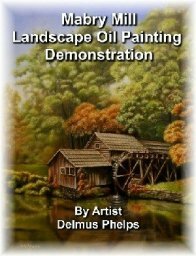 Richard has a great assortment of impressionistic style painting instruction on his site, so do visit him and check these out. Head back to Impressionist Painters and away from Monet Haystacks.